On the average, most people likely don't think of a bicycle as an artistic object. In fact, for most people, it probably doesn't even fall into the category of craft. The idea that the bicycle must be "made". By some one. The fact that most bicycles are manufactured by large companies, a production line from a faceless offshore machine that arrive by some means into our hands renders it into a commodity. But there is that subset, small as it may be, of bike-like objects that are produced by people, small companies, possibly even one-person operations, making in the numbers from small runs to one-off customs. 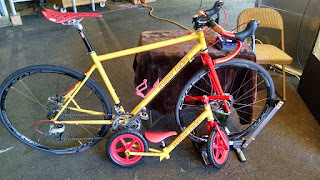 A recent thread on one of the forums I frequent explored the idea of whether bike making is a craft or an art, whether one who makes bikes is an artist or a craftsman (or craftsperson, as I know of at least a few women who share the trade). I found it to be an interesting question, not one that can be answered in just a few words. And so I thought it might make a good topic to explore. 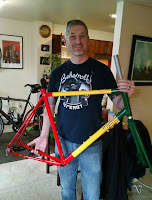 I "hang out" with several custom (or some call it "made to measure") bicycle frame builders, using media from aluminum, steel, titanium, carbon fiber, and even wood. Construction methods vary. Some use the trade as their sole means of support, some are hobbyists who build a few bikes a year, some dabble in the craft for their own purposes. Sure, it's an online community where several discussions are playing out simultaneously over extended periods. The topics are generally explored in depth, with many of the best builders in the industry lending their expertise and extensive experience. If it's useful, it's craft. If it isn't, it's art. One person on the discussion thread quoted one of their mentors, using that line. I don't think I agree with it, however. Almost universally, framebuilders recognize their wares as tools first. A bike is, at its core, a means to propel a human from one place to another under their own power. The variables of rider size (and weight), strength, body position, weight balance, and terrain inform the design of the final product. The design must first satisfy its core purpose and support the above parameters, and do so ably with endurance. So there's this useful object made by someone... That would make it a craft. But is it, or can it be, art? In order to make art, you must first master the craft. There is an entire cultural line of thinking in Japan, usually in very traditional things, which makes mastering something the art itself. Ceramic pottery, shooting an arrow at a target from the back of a galloping horse, even serving tea. In mastering the craft or the activity, it becomes art. HOW something is done is the art, and in that art, the finished product approaches perfection. My particular method in framebuilding is fillet brazing. Meaning I heat up the steel tubes to a certain point and melt in bronze such that it glues the tubes together with a little concave fillet around the joint. The better the skill, the smoother that joint is after it cools. It is normal to file and sand these joints smooth and even afterwards to provide an organic transition from one tube to another. There are a very few builders, Eric Estland of Winter Bicycles and Steve Garro of Coconino to name two, whose skill in laying bronze is such that I would pay extra for them to leave the joint raw -- no filing or sanding after. My skill isn't there, yet. But those two, I feel, have elevated the craft to art. It's not that watching them DO is so elegant, but the final product is. Uh, yeah, so moving on, maybe what makes something art is that it inspires something, makes the viewer feel something. It's meant to reach inside the viewer and stir some emotion. With a bicycle, I imagine it takes a certain level of two-wheeled obsession to see it as something more than a tool (and to a large -- by more than one definition of that word -- percentage of the population, more than a toy). And probably even more of a bike nut to actually "feel" something. Likely the bike frame builder isn't looking for the rider to get all teary-eyed. Seeing a smile or two is enough. Anything more tends to get a little embarrassing. The real inspiration sought is that the rider wants to do exactly that -- ride the bike. In 2015, I was exhibiting my bikes at the Oregon Handmade Bike and Beer festival. Part of my display was my personal "gravel" bike, with my young daughter's kick bike leaned up against it. Matching paint schemes and graphics. It was an attention-getter, to be sure, even though I wouldn't consider either one to be my best work. Many smiles, some conversations started. Towards the end of Saturday evening, a gentleman came by as the crowds were dwindling. He walked with the aid of crutches, carried a backpack. He stopped at these two bikes, and I could hear his breath catch a bit. He lingered. Then he leaned over to me, with tears in his eyes. "I'm really tight with the local artist community around here, and, well, I admit that I've had a few of these (gesturing with his mostly-empty pint glass), but I've got to tell you, this is just ART, man." It was apparent that seeing those two bikes together, so obviously a parent/child thing, made him feel something. Yeah, most likely aided by the I-love-you-man level of inebriation. It wasn't my intention to make art, but apparently I backed into it, at least in this gentleman's view. The bikes I make aren't adorned with any extra flourishes. No intricate lugwork or flashy stainless steel logos. I may use a stainless steel part here and there, but that is for the purposes of corrosion protection, not appearances. 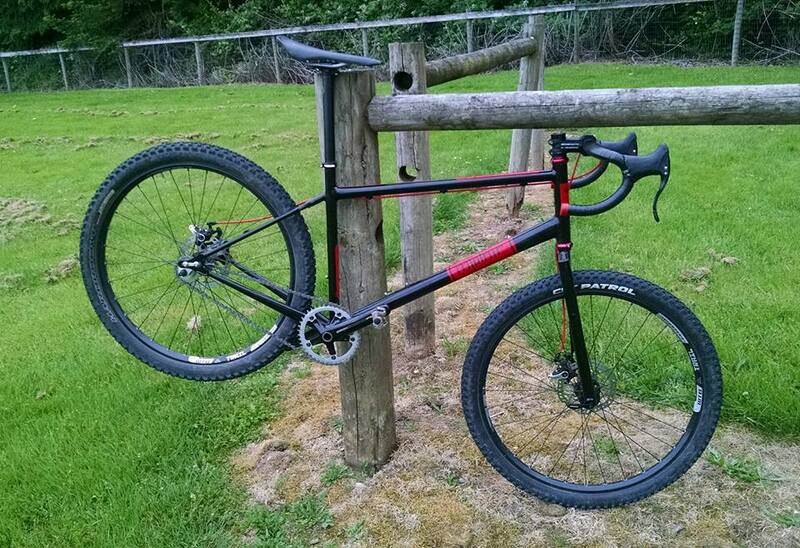 The bike frames I make are built to suit a particular rider, with the ride feel they desire on the intended surfaces. Even within the cycling-enthusiast subset of the population, the only person who will really experience how that comes out is the person for whom the bike was made. It's not going to fit some one else exactly right, and that person might have a different idea of how a bike should respond to input. My art, if I were to categorize any of it as such, is hitting that target perfectly -- the bike that fits that one rider with no compromises, and responds to that person's weight shifts and steering inputs as if it were wired directly to their subconscious brain. Because I want that person to ride their bike. I surpassed my year's goal ride time over this past holiday weekend. This is the second year I've made it over 500 hours of on-the-bike time, a goal I made on a whim towards the end of 2014 after feeling like I hadn't done all that much (though I'd made just over 385 hours of ride time). I passed the 500 hour mark on Black Friday, while much of the nation was joining the annual shopping melee. With the typical Pacific Northwest weather, and my lack of desire to go out onto the roads when visibility is already low or to subject myself to prolonged exposure to rain and road spray, I put in a session on my stationary trainer. In fact all my riding over the holiday weekend was on the trainer. Yeah, the goal died with a whimper. The "drainer", as it's lovingly called in many circles, is comprised of an old Scott Waimea aluminum frame, cracked at the seat tube extension that holds the seatpost in place, semi-permanently affixed to a Cyclops "The Silencer" Direct Drive trainer. Which means I take off the back wheel and clamp the frame by the rear dropouts. But I don't find it all that silent. In fact it's just as noisy as the 20-year-old Minoura it replaced. Anyway, I've been tracking the hours of the various forms of riding I've done the last two years, and find that I've been putting in a LOT of time on the trainer. More this year than last year, to the tune of 160+ hours so far. More than I've done on the mountain bike this year, and approaching the road miles I've put in so far. And given that the remainder of the year is often the worst, weather-wise, it's likely that the number will only go up. I've also been participating in a 30-day plank challenge on Velocipede Salon, which started with short daily planks and has progressed exponentially to over four minutes (with two days remaining, and upping to 5 minutes on Wednesday). Between that and the time on the trainer, my wrists are constantly aching. I need to fix the position on the trainer! Too much weight on my hands, and at the wrong angle. 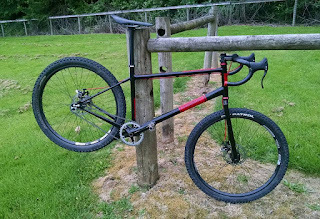 The Waimea was bought as a knock-around road bike that I could leave somewhere with little worry about weather (aluminum frame), ready to just jump on at a moment's notice. 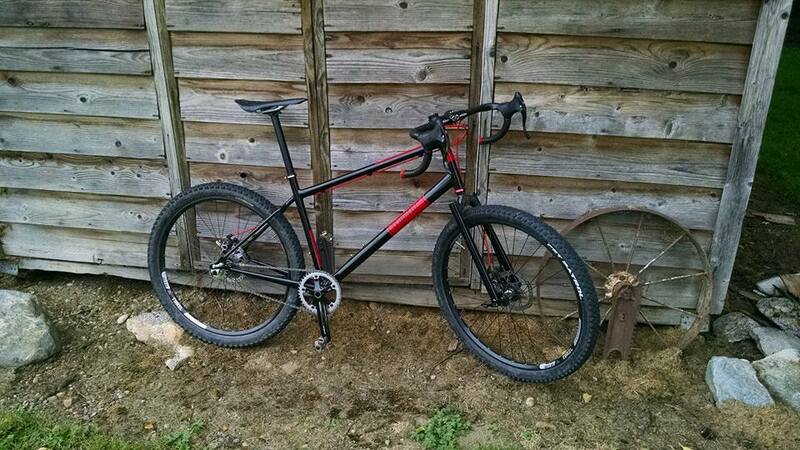 In its first year of life in my passel, it resided at work and saw many training rides around the local roads. But the position wasn't ideal, so it eventually fell out of favor. 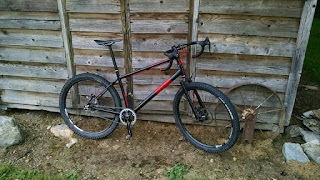 When the prospect of a permanent trainer bike came up (due to another frame essentially corroding out of existence), this was the bike that was the logical choice. But again, the non-ideal position is catching up to me. I'm hoping that a different stem can fix the issue. And I think I have the tubing in the garage to make it myself. It would be my first attempt at a part that makes a lot of people nervous (along with forks, a bridge I've already crossed with no issues). We'll see how it goes. The reason I'd be making it myself is that I suspect it will end up being a very non-conventional design. A one-inch steerer coupled to a 31.8mm handlebar, and likely very long and tall. So a new stem, a new construction, and hopefully new life and comfort on the trainer. I recently had a co-worker at my day job stop by my desk fairly early in the morning, and ask if I was a Trump supporter. I answered with my standard response that there is a reason we have a secret ballot in this country, and I don't divulge my voting habits to anyone. She then said she couldn't talk to me and walked away. But it wasn't done then, as she came back a few minutes later and launched into a "my candidate is great and why is the other getting a pass for X" search for validation. I wouldn't submit to that thinking, and discussed it in a completely neutral manner. Fact is, neither candidate is getting a pass on anything, and rightfully so. But my point with this post is not about which candidate deserves the office, or which one will do the better job of The Highest Office in the USA. I really have two points to make. So I'll get right to it without much discussion. One: You cannot vote against anyone. You get one vote per office, and you can only for FOR one person. That's your voice. It only flips one number in one column, and doesn't affect the numbers in any other column, regardless of what anyone tells you. Your vote is only a "for" vote when it comes to electing anyone to an office. So vote your conscience as you see fit FOR whomever you would prefer to see in that office. Remember, there's always the write-in option if none of them appeal. Two: I wish there were better candidates. Truly. Yes, both candidates of the major parties are human, and thus prone to error. To say I support either one would be a gross misrepresentation. I just wish that we had ONE candidate who approached the office of President with humility, treating it as the daunting responsibility to The American People that it is. My wife and elder daughter and I have been watching the new series Designated Survivor. My wife said we need Kiefer Sutherland to run for president. In reality, I think the last president who remotely came close to being a servant of the people was Ronald Reagan ("the actor?" to quote Doc from Back to the Future). It saddens me that this is what we've come to, but here we are, let's make the best of it. Regardless of where you fall in the political spectrum, exercise your rights as a citizen and vote. Vote your conscience. And come November 9th, when the results are in, let's get together as one people, one nation, and make this thing work. Some equipment gets neglected, more because it just works, taking daily (or nearly-daily) abuse and just continuing on without complaint. Time goes on and you just kind of don't notice it. Until it doesn't. And you do notice it. 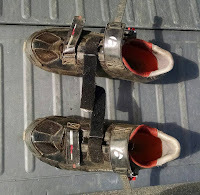 Yesterday was one of those rides for me, and the equipment that got noticed was my shoes. I have issues with shoes, being a difficult fit. No, my feet aren't particularly wide or narrow. In fact, some time back I actually measured them against the industry standard and found that they were pretty much spot on the medium width of D for men. Toe problem is my toes. Or really, where my toes point. Take a look at your shoes. Chances are, unless you're wearing Altra running shoes, or Bont cycling shoes, or some variation of Vivobarefoot, Vibram, or Birkenstocks, your shoes come essentially to a point at the toes. Draw a line from the center of your heel to the center of the ball of your foot, and then another from the center of the ball to the center of the big toe. Do they form an angle? Do they form a significant angle? For some reason I cannot fathom, most every shoe maker assumes that everyone has that same significant angle. It's called a bunion in the medical community. But it only comes to medical attention when it causes pain and joint degradation. But the funny thing is that in cultures where shoes aren't worn, those two lines aren't two lines at all -- they're one continuous line. Straight from heel to ball to toe. And bunions just don't happen. Kind of begs the question of whether the shoes cause the condition. Anyway... My toes do the same thing under weight bearing. One straight line from heel to toe. So finding shoes that really fit is an issue. I love Altra for sticking with their FOOT shaped last. And if the market for running and casual shoes is thin, cycling shoes are downright dismal. Bont comes close, but the depth of their heel cup causes the collar to dig into my ankle. So anyway, back to yesterday's ride. After doing my normal trail work, I hopped back on and started riding. My right foot started feeling a little sloppy. So I cinched down the strap a bit more. And it still felt sloppy. No matter how much I pulled the straps tighter, I could still feel my foot moving around. So I took a closer look. The upper was peeling away from the sole all the way from the tip to the arch, and well into half-way across the shoe's width. After three-plus years of complaint-free riding, doling out abuse on these kicks and doing little more than letting them dry out, they finally said "enough". And I'm okay with that. I don't feel like they owe me anything. I bear no ill-will toward Bontrager. My search for new mountain bike shoes begins in earnest. I've employed my old Sidi Lazer road shoes for the task of my lunchtime rides and trail work until I find suitable replacements. A stop-gap measure that is less compromise than a desperation move. 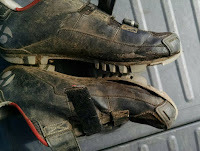 To say the Sidi's are less than ideal is to exercise an extreme gift of understatement. This past Saturday I did a reconnaissance of the second-day course for the ride I’m hosting in two weeks – the Lucky Masochist’s Gravel Deuce. This course takes us through two off-pavement sections that are part of active timber sales which are not on state land, so there is the possibility that they’d be rendered impassable by various factors. Even last year on the first rendition of this ride there was some question, as I hadn’t ridden the route since the previous year. Some washouts made things interesting, but other than requiring a dismount, it was all good. I made the drive to the Lucky Eagle Casino, departing from my house at an almost-early 7am, and with clear traffic arrived at the scene of the crime in just over an hour. The shenanigans started as soon as I was preparing to ride. Tire levers? Oh, those were in my locker at work along with my lighter arm warmers, left over from an urgent get-to-the-restroom loading of the bike on Thursday (I usually leave them in the car, but kept them in my jersey pocket to save a few precious seconds). Well, at least I could use a quick-release skewer if needed, and I’ve pulled these tires off without tools before. At least that seemed to be the only thing missing. Until I turned on the Garmin to load up the day’s route. “Lucky Deuce Day” was listed, but only once. I knew that the unit I have truncated off the last digit of the course name, but I’d always had two on there, for each day’s course. I tapped the screen to bring up the course, and sure enough, it was the day-1 route. Turns out that with one of the latest updates, that truncated character wasn’t even in the memory any more, so it now assumed that these were the same course and discarded one of them. What to do? I looked at the hotel across the street, where I’d planned on doing a check-in to reserve the room for the ride weekend after today’s ride. Maybe they have a computer that I could use to download the day-2 route? I had the cord with me, so off I went to hopefully save the day. Well, yes, they have a computer, but with security set up such that I couldn’t download Garmin Express to connect to my Edge Touring device. Stymied! I had a flash – I’d also duplicated the routes on RidewithGPS. A quick load of that onto my phone, and there the route was… Saving grace! Or so I thought. Until I got on the bike and went to turn on the navigation. “Not supported on your account.” What? I’ve used it in the past. I tried another function. “This function only supported on paid accounts.” Ah, so that was their thing – functions that had been part of the free offerings were now only available if you paid them for it. In the true spirit of adventure riding, I put my phone back in my pocket, said “here goes nothing” (okay, that’s not really what I said, but this is a family-friendly blog), and started off on the day’s ride, hoping that memory and luck would guide me through. I pushed out east and south, into the first climb that would take me to the gated gravel road of the initial off-pavement excursion. The first turn came sooner than I expected, but the distance to the forest road felt like it was expanding. Did I miss it? Or did it just not exist any more? Finally I arrived at the turn-off, ducked under the gate, and journeyed into the wilds. It all looked familiar at first, but then opened up into a very large clear-cut. Nothing looked the same. What had been dense and fairly dark forest was now wide open stumps with scattered piles of slash. The roads all looked different as well. I hit the steep uphill that I hoped was right (it felt right, but with everything looking unfamiliar, I wasn’t sure), then took the middle fork of a tree-way intersection… It wasn’t until another mile later that I was assured I was on the right path. Right about the time I hit a sharp rock with my front wheel, and heard that “hiss-ss-ss-ss-ss”. The tube change was uneventful, and the tire hadn’t sustained any damage, so I was on my way again quickly. The last half-mile of this section, after a good mile long descent, was a bit overgrown, long grass bent into the double-track making a fairly narrow path. Last year when I’d ridden this, the grass looked the same, but was soaked from the rain. Today, while the rain had been light, the grass was somewhat dry, so I didn’t get the soaking that the last time I came through here produced. I was feeling like a navigation rock star, having made it through the first section with no wrong turns, in spite of how the landscape had changed. On pavement again, I turned west and north, quickly arriving at the entrance to the second off-pavement sector. The gravel was in good shape, with just the occasional blackberry vines encroaching into the roadway. As I ventured deeper into the woods, I scared up deer multiple times, and one owl. I passed several turn-offs, some of kept count in case I needed to turn back and re-route. Four miles in, a downed maple provided a challenge. How to cross through? I mentally tried two paths before arriving at the conclusion I’d have to break some (rather large) branches to make it. I like traipsing through the woods in silence, mimicking the natural fauna as much as possible. The snapping of the branches might as well have been a brass band announcing my presence in the solitude. But at least there’s a somewhat clear path through this obstacle now. Back in the saddle, I pushed on, arriving at the last descent sooner than expected. More deer (with fawns this time) dashed off the road, just before the first of four wash-outs. It wasn’t until this point that I truly knew I was on the right path. Anyway, last year, there was a sign warning of the road being closed due to these wash-outs. That sign wasn’t there this time, and though I didn’t think they’d been repaired, I was hopeful that they at least weren’t worse. Turns out my hopes were right, and some quick dismounts got me through. Up a last hill, and onto pavement again, I checked the time, and opted to drive out the last section to the Brooklyn Tavern (worth a post all on its own) rather than ride the 22 mile out-and-back, and rode back to the casino. Thirty miles, two off-pavement with the potential to get lost several times, and no wrong turns. Memory, luck, and instincts got me through the ride safely. That rock star feeling swelled. But I renamed the routes and loaded them onto my Garmin as soon as I got home.